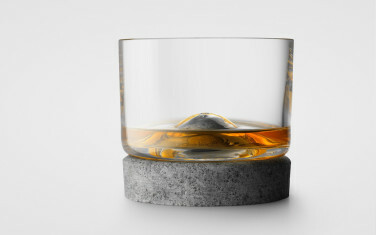 Tundra, meaning frozen ground, is a whisky glass designed exclusively by our EGGS product designers. It’s a chunk of the Nordic wild mixed with a delicate touch of modern sophistication, and is meant for those rare, self-indulgent moments to yourself. Although it’s aimed at the whisky connoisseur, who’s to say you can’t enjoy a refreshing gin and tonic from it. It combines elegantly hand blown glass with rough-textured soapstone to create a contrast between the solid and the transparent, the durable and the fragile. Man verses nature, as it were. 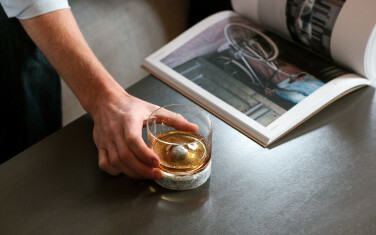 The soapstone base retains the cold, therefore chilling the glass from beneath - allowing you to relish your favourite tipple without you having to put ice in it. So, how did EGGS get involved in all this glass malarkey, we hear you cry? The thing is, we were asked to take part in the 100serie design exhibition. An invitational project that challenges five Norwegian design studios to come up with an exclusive marketable product of 100 limited copies. "This could be fun," we thought. But despite exploring numerous ideas, we were stumped. A trip to the pub was called for. It was here that we finally came up with the concept of glass upon stone, and Tundra - after a few beers to get the creative juices flowing of course. Like we said, this was a "fun" project after all. 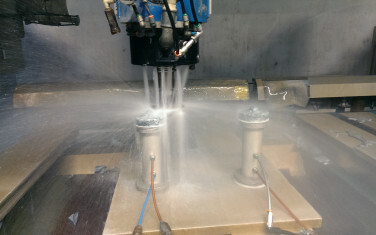 Next we contacted various manufacturers, and lucky for us they loved it. Before we knew it, we were in business. Well, as it turned out we sold all 100 before the exhibition was over. We then set up an online store and commissioned a further 600. Which, thanks to a whole lot of free advertising through social media word of mouth, sold equally fast. At present, we only have 50 left. So folks, as they say, get them while stocks last. Or should that be, while rocks last? Because these little nuggets may soon be as rare as an old single malt!